1. NOTE: Please check the drop-down menus for the specific item you are looking for. Some drop-down menus have more than one price or color. 4. Shipping outside the continental US, please contact us using the form below. You can mouse click on any one of the photos below if you choose to return to that page for any reason, possibly to get additional information of that product. When ordering replacement parts for the EcoBox or FreshAir Cube, please specify which unit you are purchasing for. The power cord will fit either one, but the RCI cell, ceramic plate and remote are different for the two models. 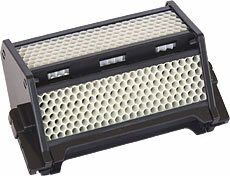 All parts and air purifiers have a 30 day return policy and a 25% restocking fee, Shipping costs are not refunded.